Visual Water Task | CerebralMechanics Inc. The apparatus consists of a trapezoidal-shaped tank containing room temperature water, with a computer monitor spanning a clear glass wall at the wide end of the pool. Visual stimuli are generated and projected on each side of the monitor using computer software. A midline divider extends into the pool from the vertical centerline of the monitor, creating a Y-shaped maze (stem with two arms). A moveable clear Plexiglas platform is submerged below the side of the monitor displaying the reinforced stimulus. 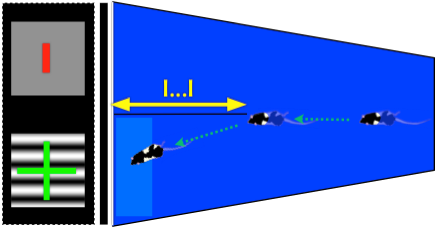 Rodents are instinctive swimmers and the Visual Water Task capitalizes on their natural inclination to escape from water to a solid structure, the location of which is paired with a visual stimulus displayed on the monitor. Animals are released into the pool from the wall opposite the monitor, and the end of the divider in the pool sets a choice point for the animals that is as close to the visual stimuli as the animals can get without entering into one of the two arms. Because animals make their choices at the end of the divider, the length of the divider sets the spatial frequency of the visual stimuli on the monitor.